On Tuesday, after our tour of the site archeologique, we took a quick lunch break at Creperie St. Pierre and then moved onto the final stop: La Musée de la Réforme de Genève. This museum retraces the history of the movement started by John Calvin in Geneva. It includes artifacts and exhibits from the start until the current age. The museum was interesting; however, a little disjointed. We were lucky to get English audio guides, but not all of the numbers could be found and they were out of order in most cases. We spent a lot of time on the ground floor figuring this out while we learned about the origination and first century of the Reformation. As we moved on, we learned just to hit the #s that we saw that looked interesting to us and continue on that way. 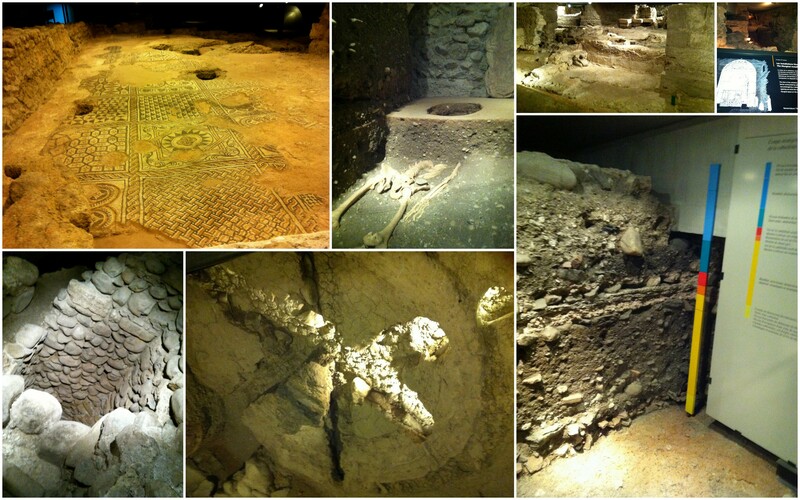 The basement floor contained history from the 19th and 20th centuries. There were exhibitions on the role in civil society, the progression and dynamics of mission work, a computer screen depicting the statistics of the denominations of religion in the US, and audio of Billy Graham and the evangelistic movement. That part was pretty neat to see how Calvin’s impact echoed through society today. You are not allowed to take photos so we don’t have anything to show. Bottom line – this museum is full of intriguing and interesting exhibits. However, it might be best to make it your only stop in the day so you can comprehend the full depth of history and really take the time to visit both the ground and bottom floor. We were a little tapped out from hitting the archeological site first, both in terms of standing and mind-power, so we wore ourselves out before getting to the basement. Those who do visit this museum, make sure to check out the Reformation Wall in Parc des Bastions as well! This past Tuesday, E-dawg and I bought a combo pass to the Espace St. Pierre. For 18 CHF, it included passes to the site archaeologic underneath the cathedral (8 CHF), the Museum of the Reformation (13 CHF), and a pass to climb to the top of the Cathedral for the view (4 CHF). Since there was a peak of sunshine, E-dawg started out by touring the Cathedral and climbing up to the top to see the magnificent view of Geneva from above. I had done this before and due to the condition of my feet, I passed on the climb and sat in a pew and relaxed. After she’d taken in the panoramic view above, we descended beneath the Cathedral. From a previous post, I mentioned there were many different Roman temples and other Christian churches on this site prior to the current St. Pierre / St. Peters. The archeological site allows you to see the evidence from the previous structures. 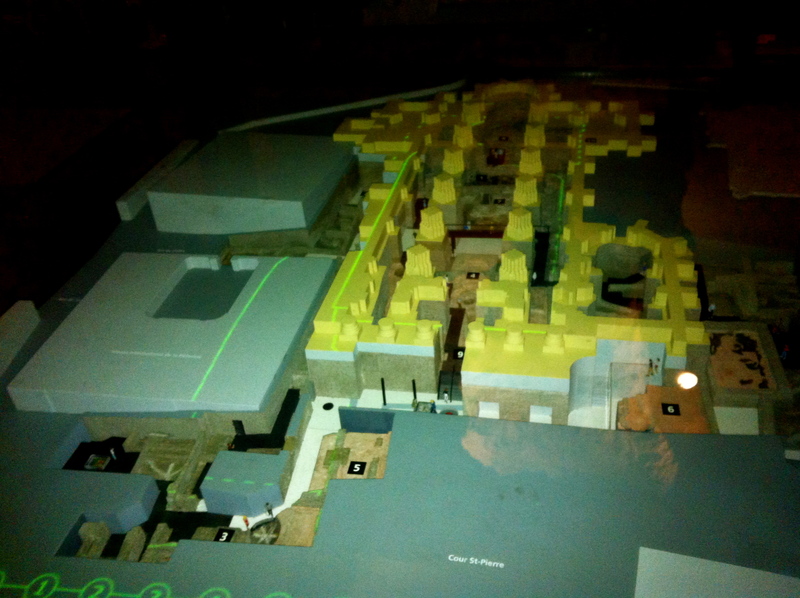 A model which lit up to show you the different eras, before your physical tour of the space. 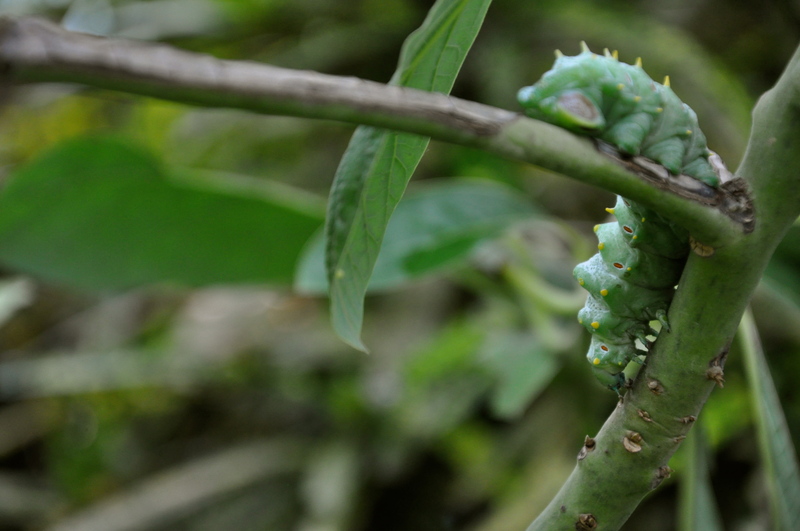 Below is a cross section of photos from our visit. Two of the most interesting things to me were the mosaic tiles in the reception hall of the bishops, and the tomb of the Allobrogian where someone had drilled a whole to pay homage to his skull. This web page does a marvelous job of showing the timeline of events, in case you are interested in learning more about the history. We really enjoyed the site and both rated it a 9 out of 10. 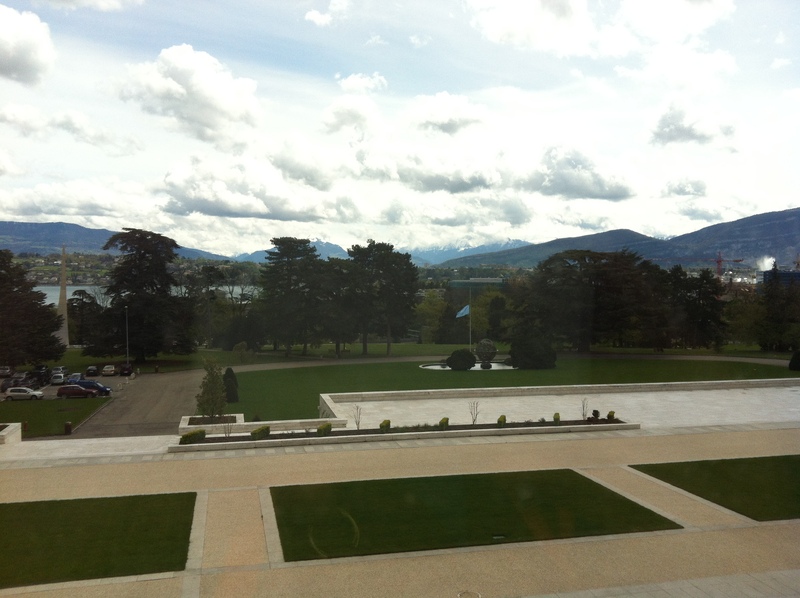 On E-dawg’s second day we had pegged the Palais des Nations as a possible stop for the rainy Monday. It was a good choice because, by default, it was literally the only museum open on Monday. 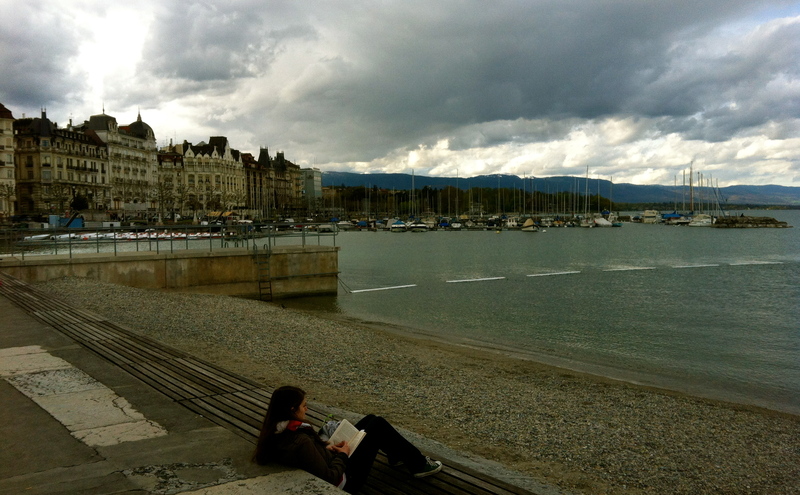 Also E-dawg had it on her Geneva “must visit” list. She had read there was a lot of walking and warned me but I decided I was up for it – couldn’t be more than a km or so. We took the bus to Nations. This was our first mistake. Or my first mistake. 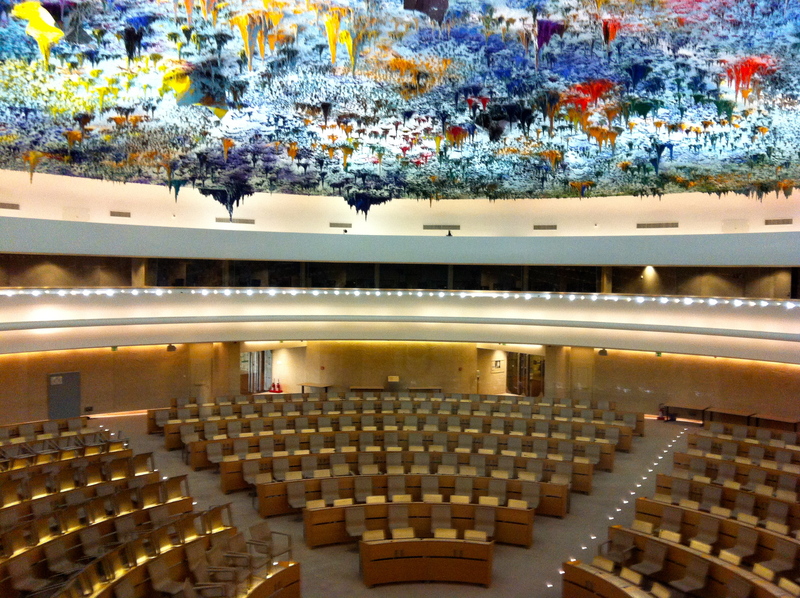 I just assumed that tourist rolled right through the colorful flags into the Palais des Nations to enter. 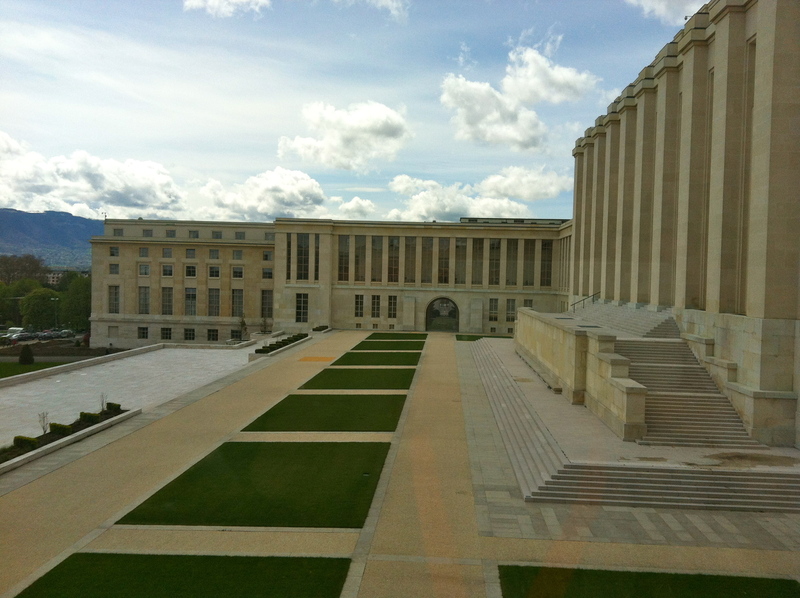 The grande entrance to the Palais des Nations. This is the oldest building and is bigger than the Palace of Versailles. 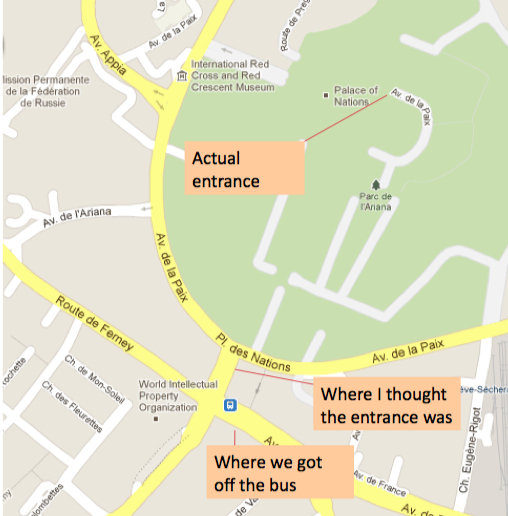 However, the actual tour entrance is was a 1 km walk away from the grande entrance. This detail would not have been very important to the old me. However, it is very important to the present-day me with healing feet. Thus, I wanted to show those readers who might be a little walking challenged where the entrance is. The #8 bus, Appia stop, gets you considerably closer. It’s important to conserve energy as this tour does include a lot of walking. They are very protective of the safety of UN workers. Rightfully so, since 3000 have died in operations or just by being in UN offices in times of terror. So, checking in for the tour required multiple steps. First, you go through an airport-style metal detector. Then, you approach a desk to register by showing your passport for scanning, getting a new picture taken, and that photo being printed into a picture badge. Next you go down an escalator, pay 12 CHF, and walk a distance to the entrance and gathering group of the tours. You approach the desk, give your language preference and wait. Then you get a bright orange lanyard indicating you are a tourist so that you can be easily spotted. We were very lucky to have an amazing tour guide. We started the tour by seeing some of the conference rooms. There are over 9000 meetings a year so they need a lot of conference rooms. We learned that in the traditional rooms, the member states sit in alphabetic order. Then comes the observer non-member states (like Palestine, Vatican City), then the NGOs that provide the link between civil society and UN. Then approved media. The UN has six official languages – English, Arabic, French, Mandarin, Spanish and Russian. If you want to address the UN in a non official language, you have to bring your own translator. Human issues conference room. The ceiling was done by a Spanish artist and was donated by the country of Spain. His intention was for the textured color to peak like waves of ocean. The color represents the diversity of opinions in the world. The art was unveiled and conference room reopened in April 2009. The current issues in Syria are discussed here. 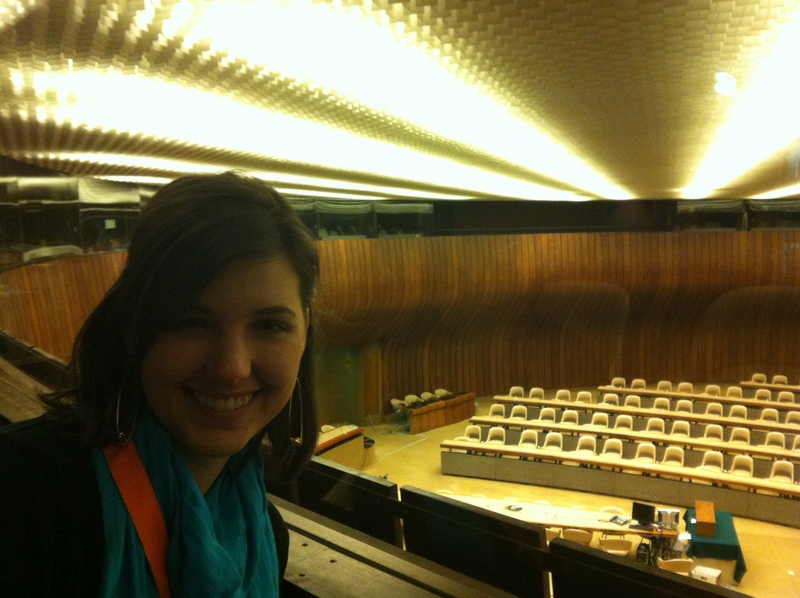 E-dawg and I in the grand assembly room in the Palais des Nations. The UN logo is different in this room, with the globe view from the top, showing no country is in the middle at the UN. Original council room of the League of Nations. The League of Nations was formed after WWI. However, they failed at preventing WW2 so it disbanded. Mr. Pettyjohn would be proud I was seeing this place as we learned a lot about it in Freshman History. 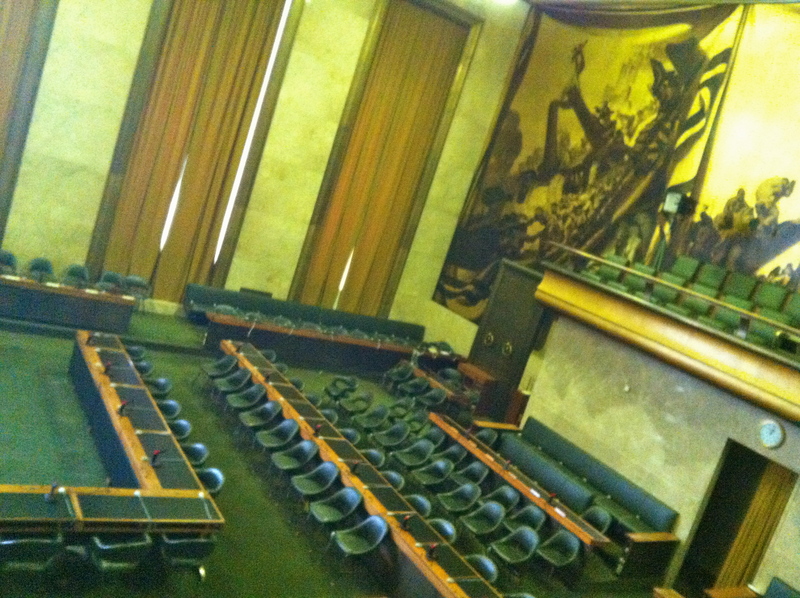 Now this room serves as the council of disarmement, preventing nuclear and chemical means of warfare. -It started with 52 members. Now there are 193. South Sudan was the last joiner. Switzerland didn’t join until 2002! 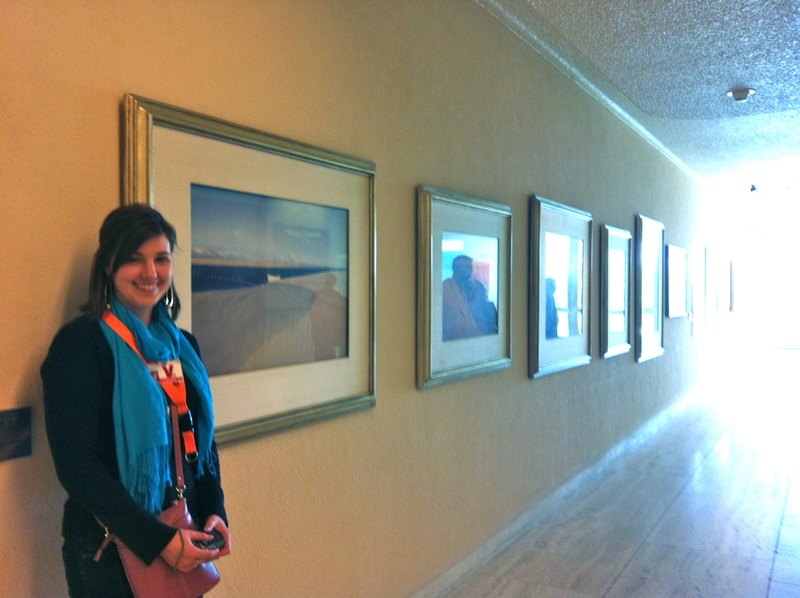 -The UN is decorated with art from all over the world, to represent its diversity among member states. In a grand entrance, there are colored marble in different designs. Our guide pointed out that the marble comes from 3-4 different countries to show integration and how great works are possible with collaboration. Pretty cool. The Russians donated the Conquest of Space and Time statue - made out of titanium like space shuttles. Sorry, its the tiny thing in the distance - I took all these photos with my iPhone. What is the difference in Geneva and NYC? NYC handles more of the political and economical issues while Geneva focuses on human rights, science, technology, health, and world disasters. 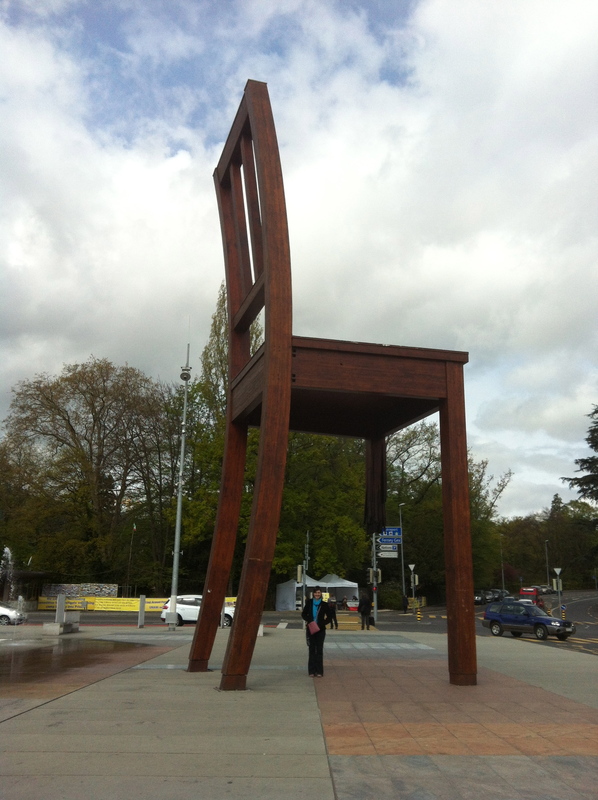 The WHO (world health organization) is one of the bigger departments here in Geneva. Also, UNHCR – the high commission for refugees, which helps 20 million people a year! Why did they pick Geneva? 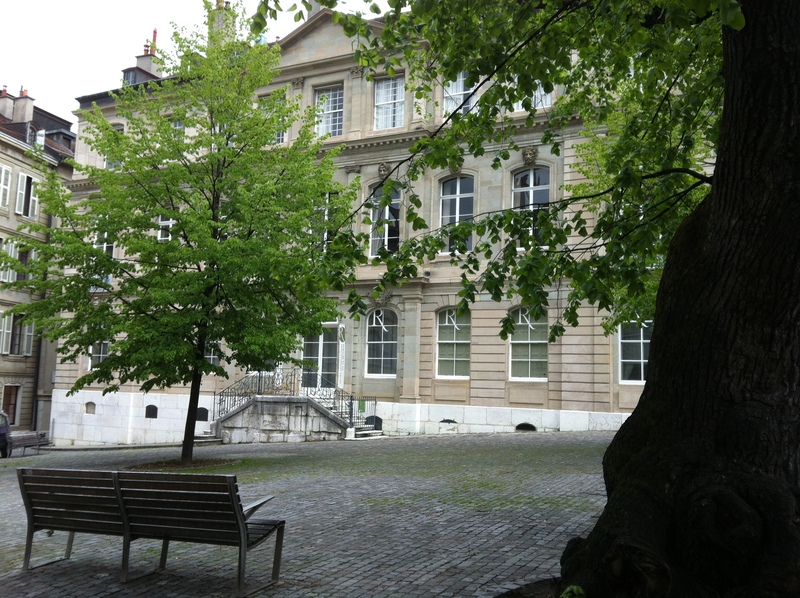 NGO, The Red Cross was already there (1863) and it had been proven to be a good place for a headquarters. Plus, Switzerland was a neutral country making it additionally easier to facilitate an organization such as the UN. 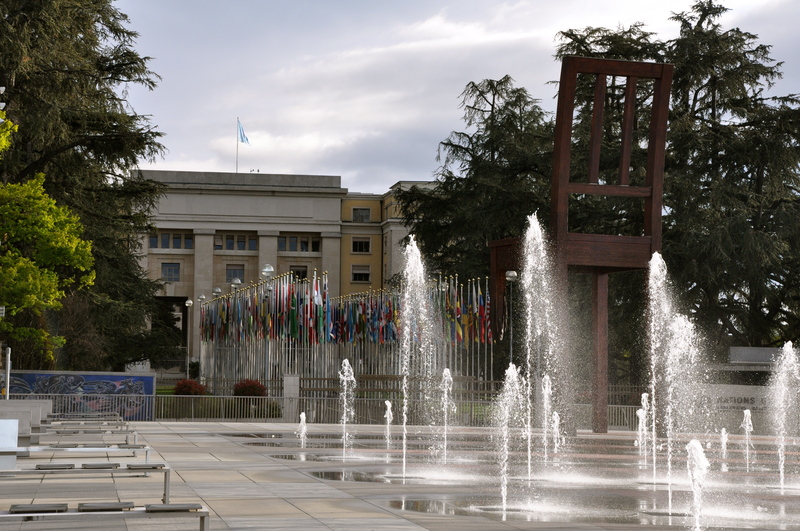 Third, Geneva was known as a very diverse city which helped exemplify what the UN’s goals are. 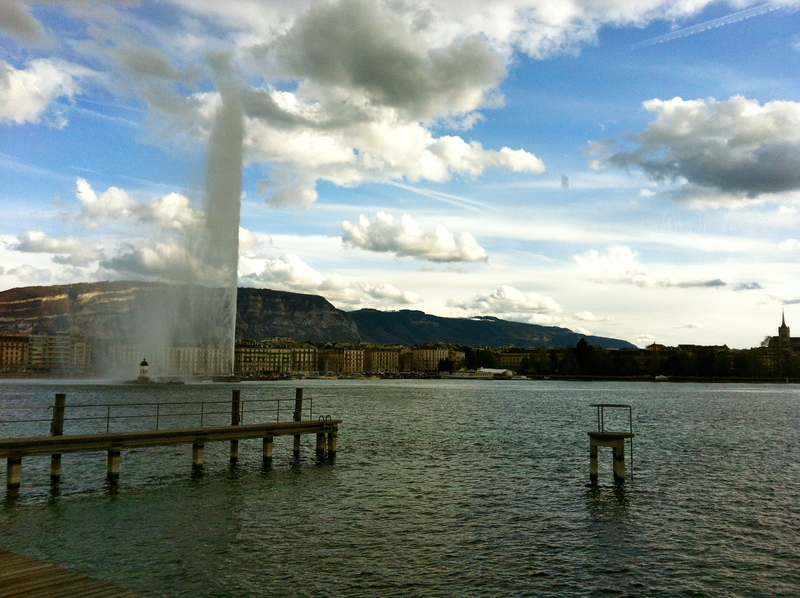 Finally, geography – Geneva is in the center of Europe and is accessible by train and airport. The views aren't bad here either. 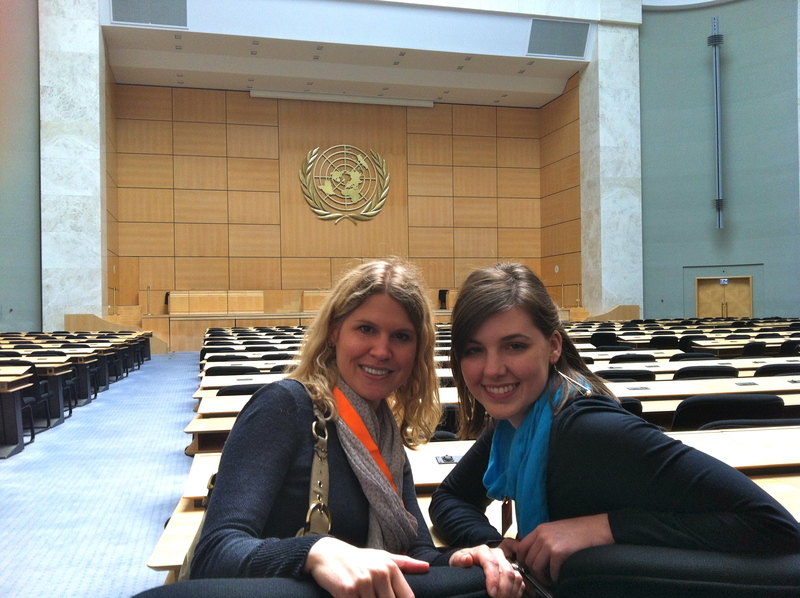 Currently, there are 8500 employees in Geneva, but 25,000 delegates participating here each year. 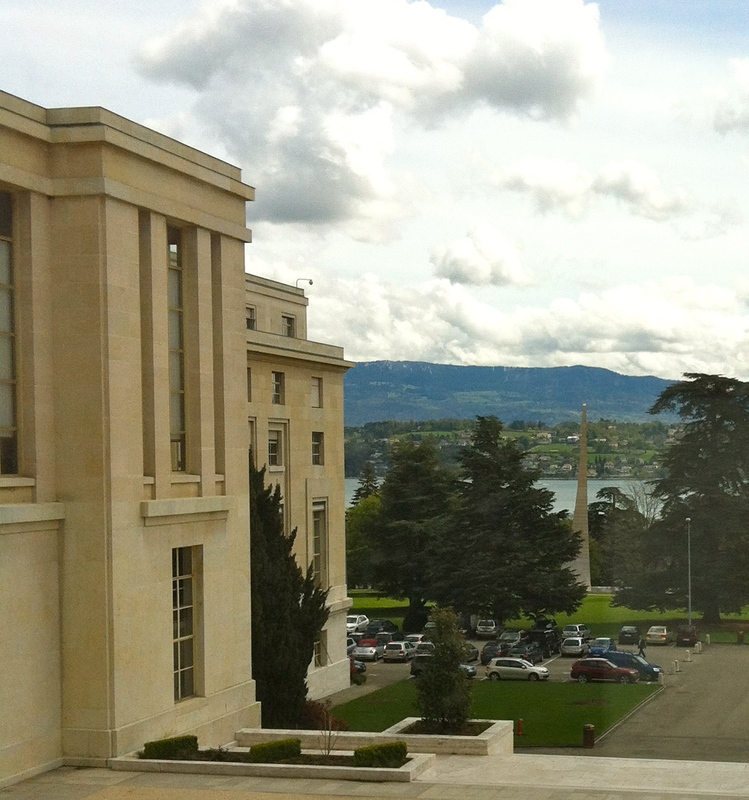 Building on that, 163 of the 193 member states have permanent missions in Geneva. I know a few women at the women’s club whose husbands work for the missions so this fact a was interesting. All in all, it was a good tour. I give it a 7 out of 10 and E-dawg rates it a 6.5 or 7 out of 10. 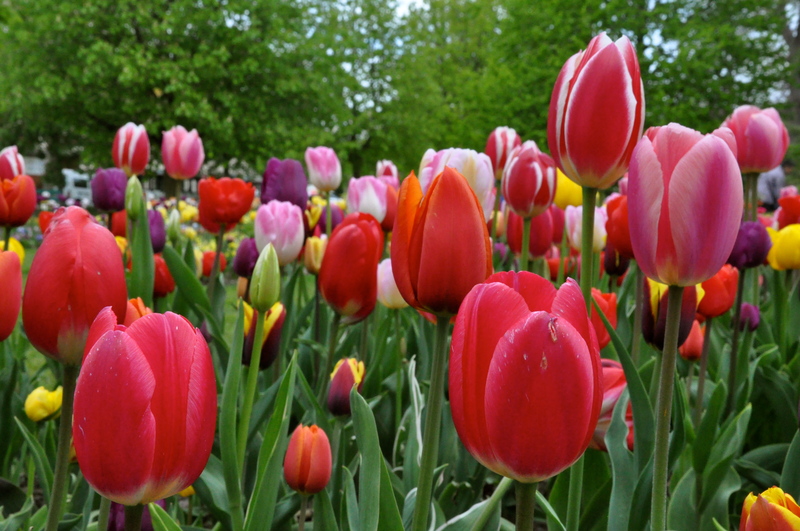 Gratitude Friday: Spring has Sprung! 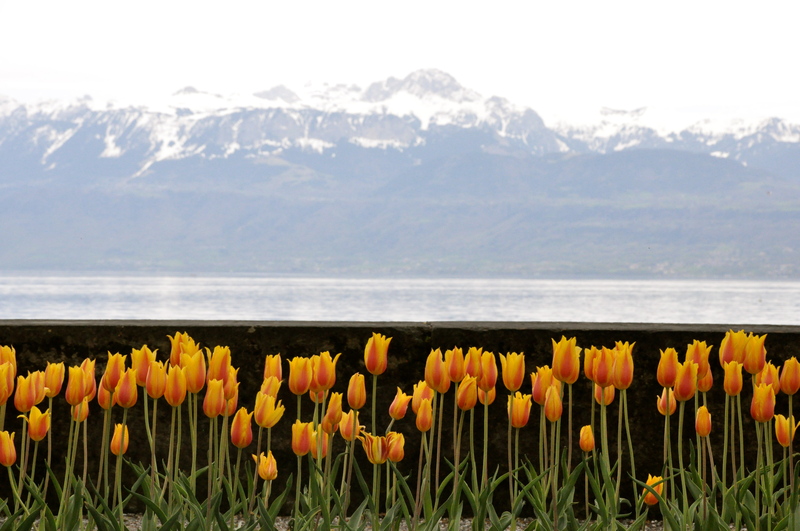 A little delayed in my posting….but Spring has sprung in Geneva. I admit I am late in this post. But mainly since I have had mobility, all it has done here is rain, rain, rain so I wasn’t in the spring spirit yet. However, we had our first day of non-rain yesterday and I am hoping that more sunshine and spring weather is on the horizon (fingers crossed). Although they do say that “April showers bring May flowers”, so I suppose there should be gratitude in the rain as well. 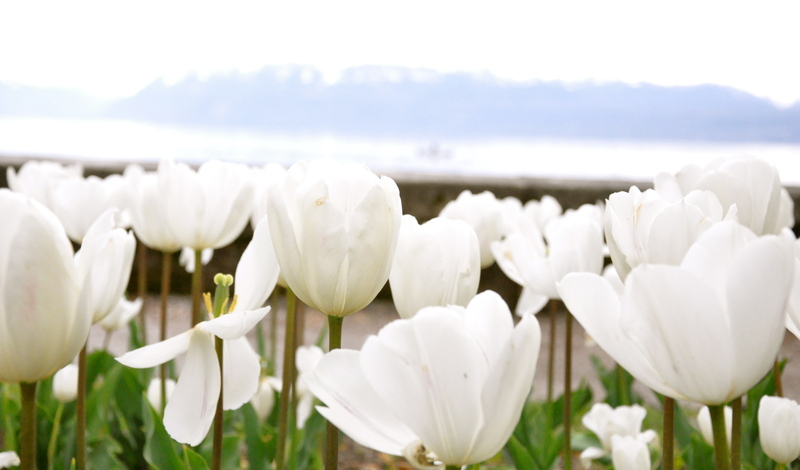 Speaking of flowers, E-dawg and I got to take advantage of Spring’s beauty yesterday on the AIWC photo group outing to Morges, Switzerland. 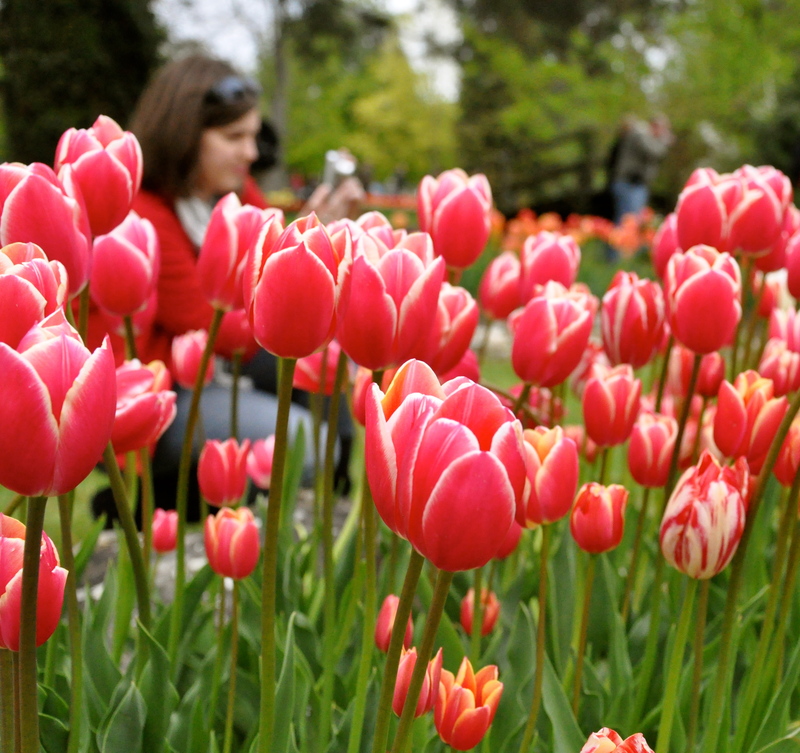 There we enjoyed lunch alfresco and explored the annual Fêtes de la Tulipe. 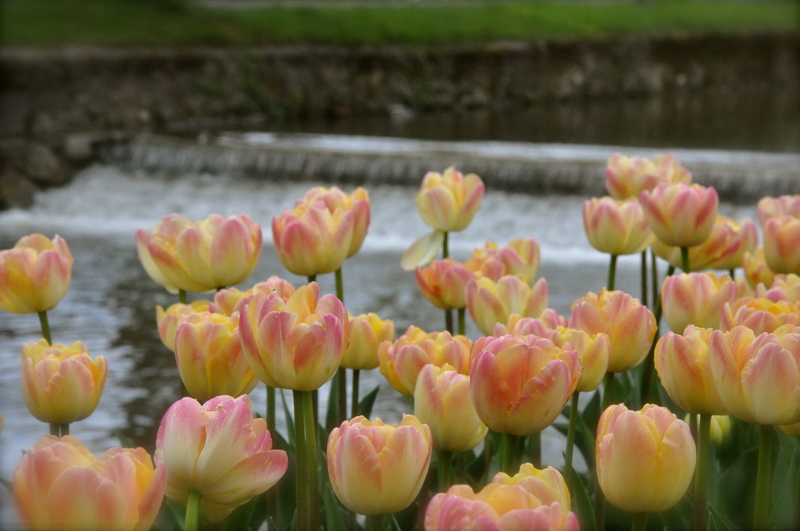 So, this Friday, I am grateful for the flowers and beauty of spring. Finally!!! But, better late than never! I am excited that E-dawg arrived safely to Geneva this past Sunday. It is great to have her here! When I woke up to downpours on her arrival day, it didn’t look good. Rain, rain and more rain. Two hail storms later, I greeted her at the airport. However, low and behold……the sun came out during our bus ride home. Thank you, Geneva! After her quick shower and unpacking (remember, I don’t let jet lagged people sleep! ), we headed out of the house to try to take advantage of the break in the grey skies. We took the little yellow boat / muette over to the Paquis to go to Bain des Paquis for an early dinner of fondue. Unfortunately, we arrived at 5pm and they didn’t serve fondue until 6pm. Fail. Poor E-Dawg was starving! We occupied ourselves taking photos and with an appetizer of viande sechée (dried meat) while watching people skip stones and ducks socialize, until it was time. Bain des Paquis is very different from your traditional Swiss fondue restaurant. 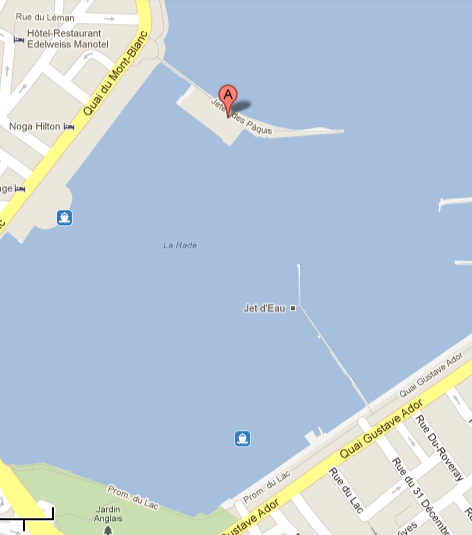 It is located on an island jetting off of The Paquis neighborhood on the right bank. Difference # 1 – it is right next to the turkish baths. You are in sight of people in their towels relaxing in the cooling air. This could turn people off from eating fondue. Non-adventerous people that is!!! Difference # 2 – You order at the counter and then they either give you your order immediately, or they bring it to you. In the case of fondue, they bring it to you. Difference # 3 – They serve fondue au crémant – it is made with sparkling wine and is lighter and creamier than other types. Mmmmm. Difference # 4- You also have the ability to order as many servings as you want no matter how big your party is. Why is this important, you ask? Well, the average US visitor cannot eat their fair share of fondue. Thus, it makes it more appealing for the stomach and the wallet to share a pot of the cheesy stuff. Who wants to waste half a vat of cheese and pay overpriced Swiss francs for it? So, in the case of E-dawg and I, we shared a portion for one (22 CHF). And it was perfect. 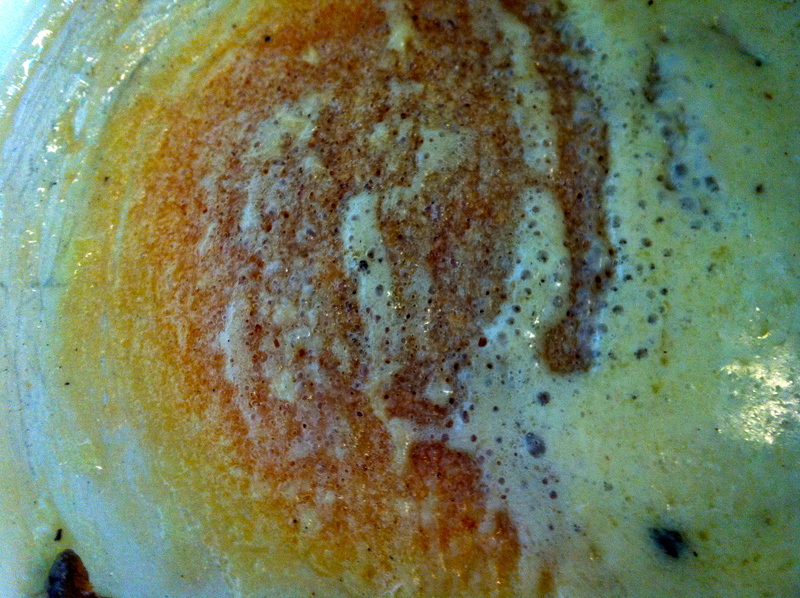 We even reached the toasty cheese-it bottom that is very elusive. The view is incredible. These shots were taken just steps away from where we ate. 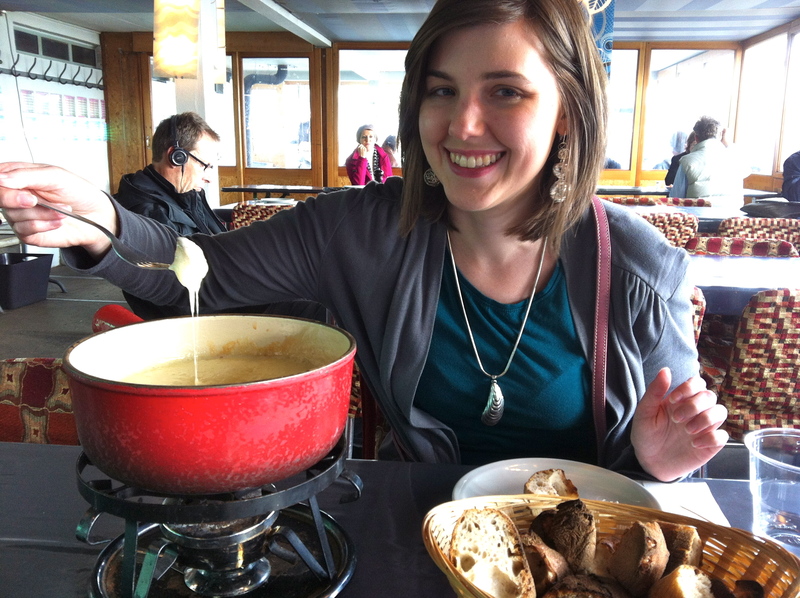 Unfortunately, the Bains des Paquis stops serving fondue at the end of April. So hurry there before the time is up! Or else, you’ll just have to wait for Fall….. 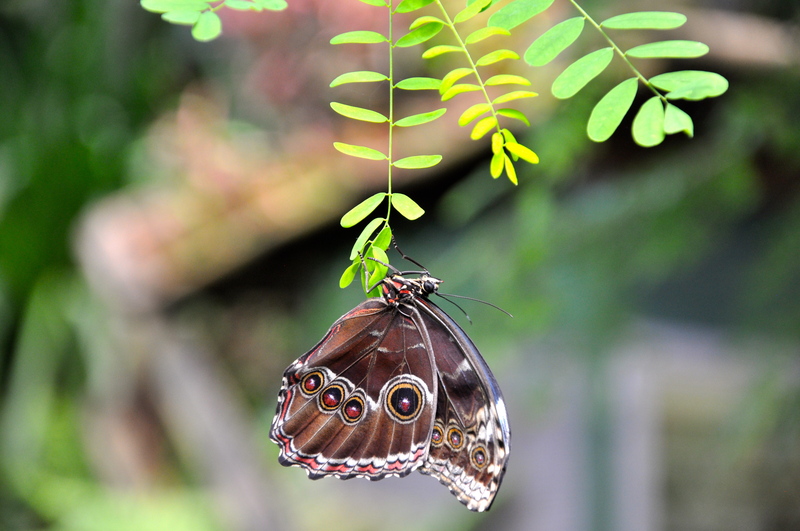 Recently, I visited Papiliorama to take a Digital Light photo workshop. 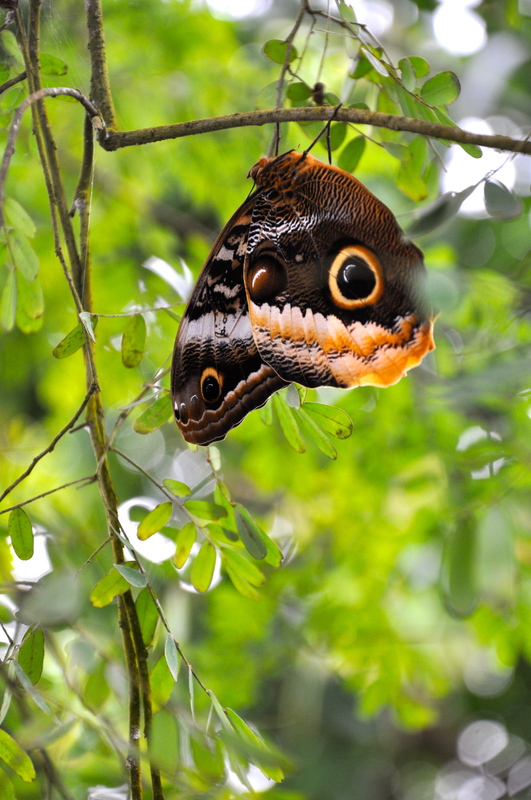 Papiliorama is a butterfly haven in Swizterland, north of Murten. 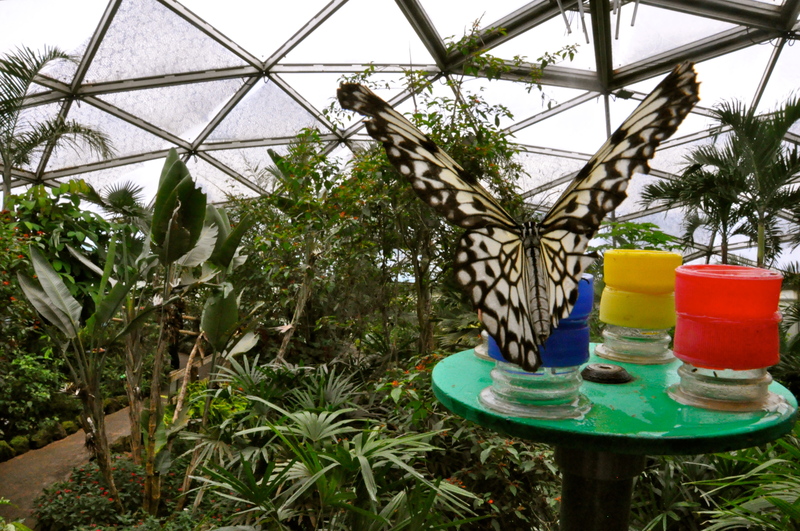 It is about a 90 minute drive from Geneva and even has a train stop at Kerzers / Papiliorama for those who prefer public transport. Luckily, I was able to catch a ride with a friend who was assisting the class. The class was meant for us to focus on a certain area that we wanted to develop. 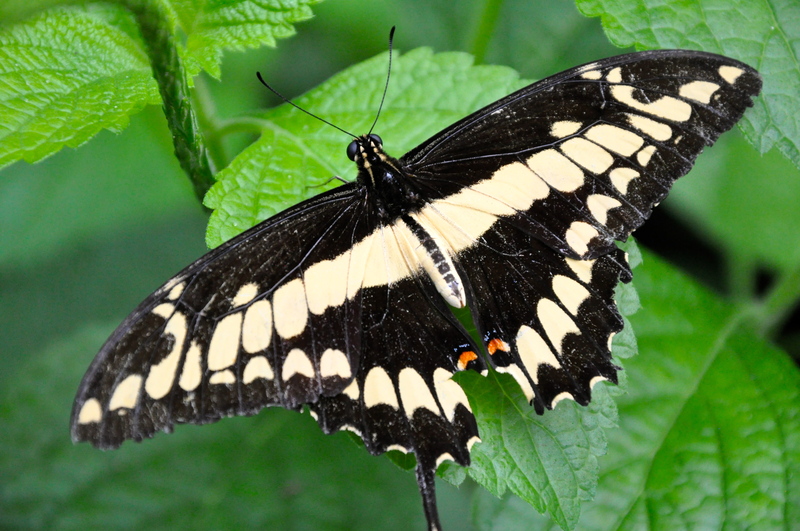 During the day, I worked on my understanding of depth of field. We continually brought our memory cards back to the workshop instructor for critiquing and guidance. 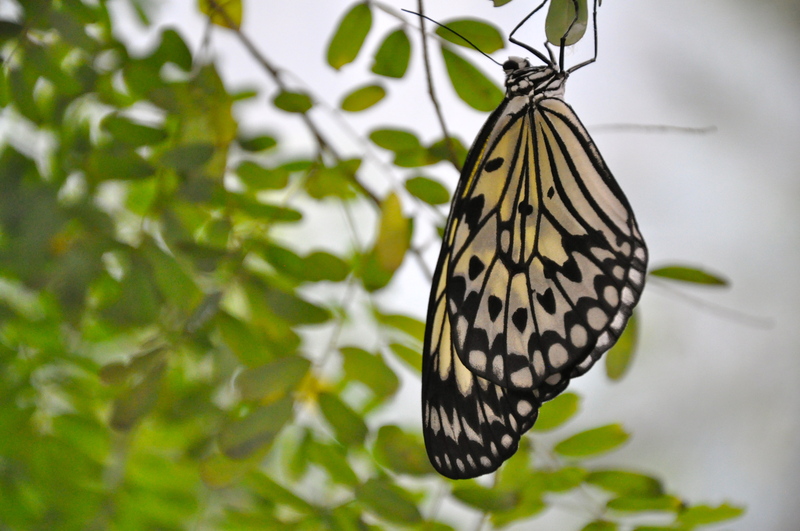 At first my butterflies are too shallow depth of field (I adore blurry backgrounds) which unfortunately kept my entire butterfly bodies from being sharp, depending on the focal plane. 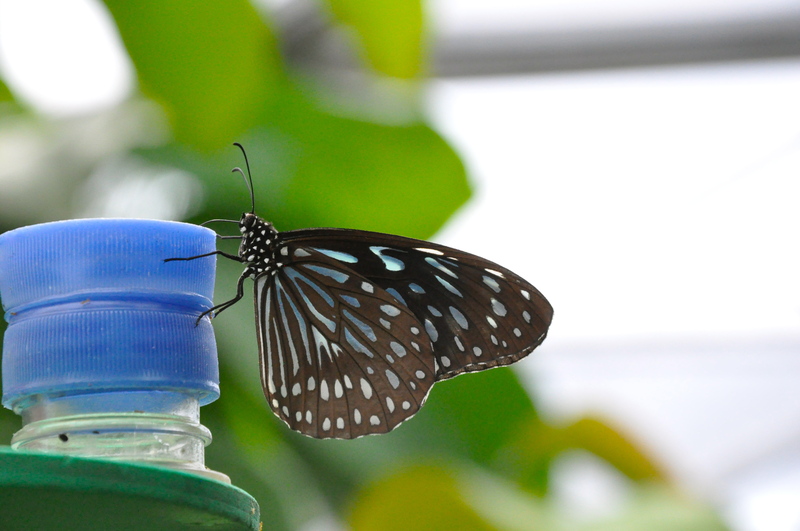 However, then I learned how to expand the depth of field by closing the aperture and increasing ISO, still achieving the background result I wanted. 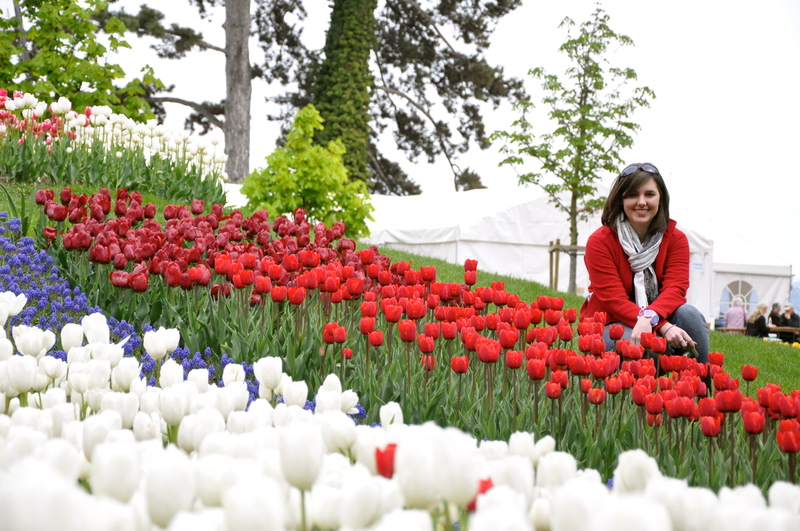 Geneva folks, you’ll have to add this to your rainy day to-do list! We were excited to have Gabe’s cousin, Couch Surfer, staying with us for four days in Geneva. She has been traveling all over Europe for 6 weeks. Unfortunately, the weather this April has been rain, rain and more rain. To no surprise, we woke up on her second day to gloomy skies and downpours. 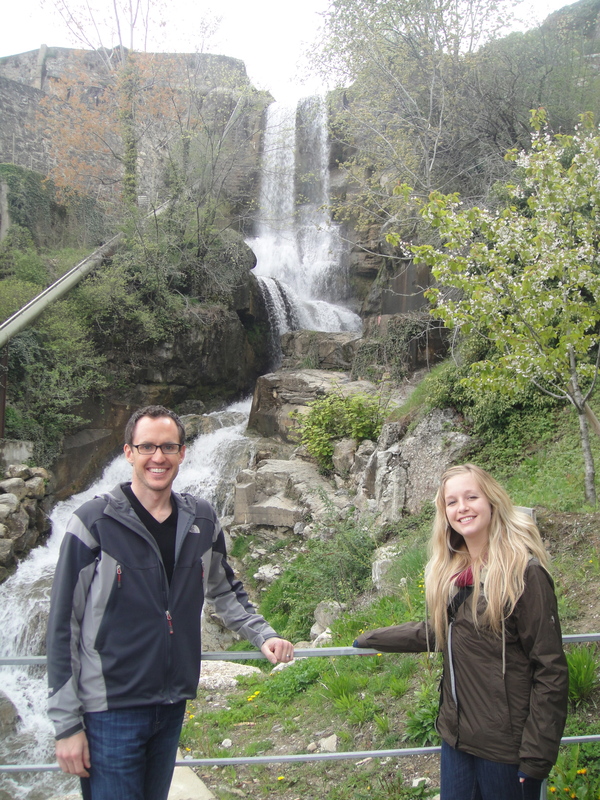 Which begs the question….what in the heck do you do with a guest in Geneva in the rain? Especially….on a Sunday? Basically, our conclusion was to taste our way through Switzerland. And thank goodness that while all cultural attractions in Switzerland are closed on Sundays and Mondays, the culinary attractions are still a possibility. 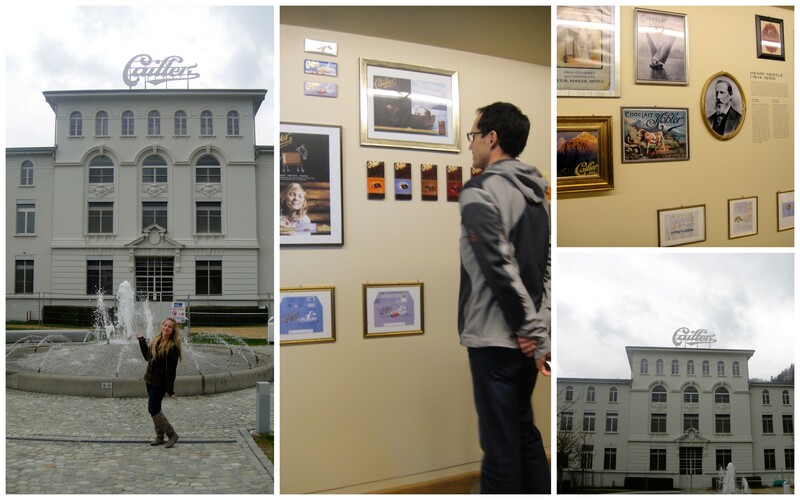 The Cailler Chocolate Factory is about an hour and a half drive from Geneva, in Broc. It is located right next to Gruyeres and the Cheese Factory making it convenient to hit both in the same trip, time allowing. We had been to Gruyeres before with Andres, but not to Broc. 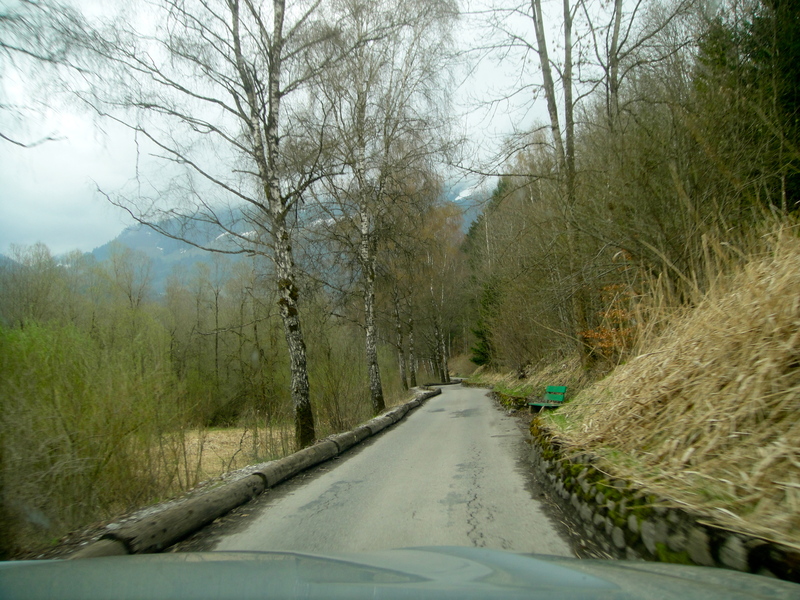 As we drove and got closer and closer to Cailler, we realized we were in the middle of nowhere. Where I grew up, we would call this BFE. Our GPS showed we were one mile away from the famous chocolate factory. Really? 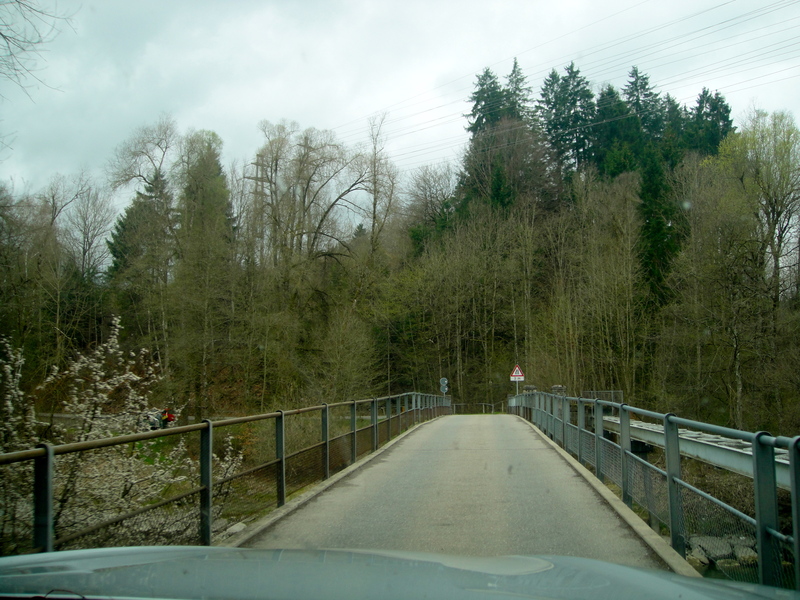 Our GPS didn’t fail us – we were in the right spot. Later in our tour, we learned why Cailler is in the middle of nowhere. Basically, they wanted access to great milk (cows) and a water supply (Alps). They also say the chocolate tastes better because of the fresh air of the alpine landscape. Thus, the undisturbed panorama in Broc could provide both. And no worries about a collision with a tractor trailer on the one lane road – every piece of chocolate is shipped out via rail. That is except what goes out in tourists pockets! We were grouped into a small cluster of other English speakers for our tour. 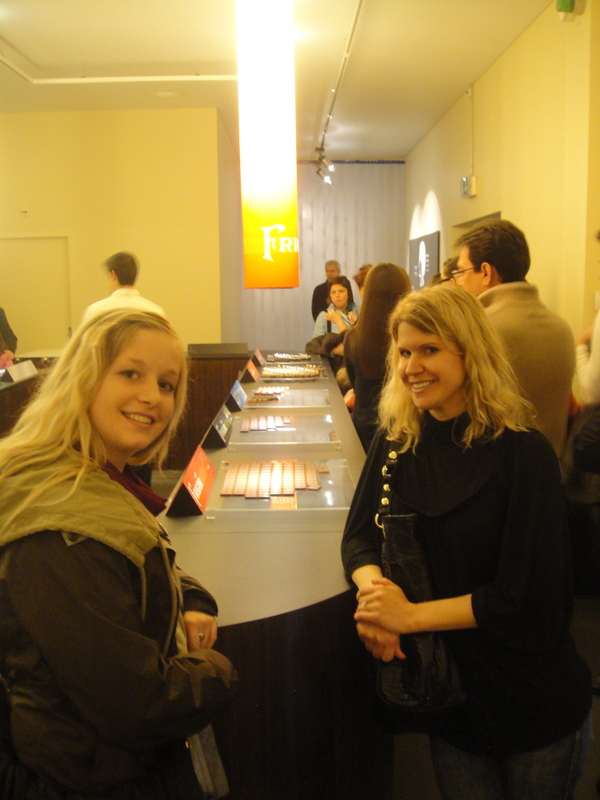 The tour was “self-guided” and started by shuffling us through a series of rooms/exhibits to tell the story of chocolate. It started with the Aztecs and the story of their discovery of the cocoa bean. They mainly used it to make Chocolati, a cocoa-based drink, which they considered a drink of “the gods”. Trouble soon arose when Cortez conquered the land and the Aztec people and took the cocoa beans and recipe for Chocolati with him back to Europe. There, the beans became used as a currency and grew in popularity amongst the nobility (poor people couldn’t afford it). The controversial drink raised question with the Dominicans, as they suspected that it was a drink of sin and could provide a way for evil to enter the body. Luckily, Pope Pius V declared it okay and also indicated that drinking the yummy substance didn’t constitute a break in fast during Easter. It’s popularity continued to grow throughout Europe, particularly in Paris, and it was marketed as an aphrodisiac. The Belgians and Germans contributed a great deal to the Chocolate Movement. However, it wasn’t until the 19th Century that the chocolate movement moved to Switzerland. And, they caught up fast. 1n 1819, Cailler opened the first chocolate factory in Switzerland. In 1875, Peter “invented” milk chocolate by figuring out how to fuse the chocolate with a valued Swiss resource: dairy. Nestlé who had invented baby formula from milk, helped add to this new delicacy with his know-how around milk and manufacturing. During the Great Depression, Nestlé and Cailler actually merged for survival. Swiss chocolate is said to be the best because they were the inventors of milk chocolate. However, don’t discredit the dark so fast….it is also a specialty because of the specialized conching (the process in which chocolate gets smooth and shiny) and aging that is unique to Switzelrand. 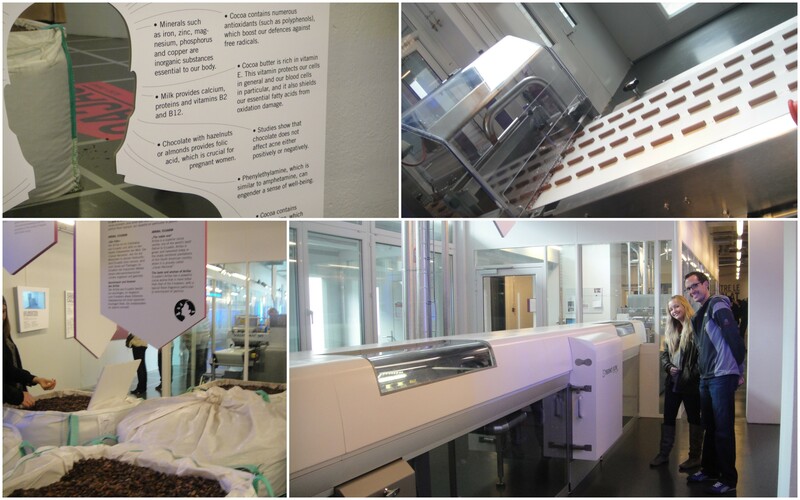 After learning the history, we got to touch the beans and ingredients, learn about why chocolate is good for us, and watch Branches being made. If we have brought you chocolate from Switzerland, there is a good chance you tried a Branche bar. We got mini branches to taste and then we got to go the tasting room, with 15 types of chocolate. They were smart and had a chocolatier on guard so that guests couldn’t scarf up all the chocolates. Also, we had heard to “hold out” in tasting as the ones at the end are the best and you don’t want to burn out, so we did so. The tip was accurate. The nicer ones were at the end. I adored the dark Ambassador ones with coffee and hazelnut filling. Me & Couch Surfer, getting ready to taste! 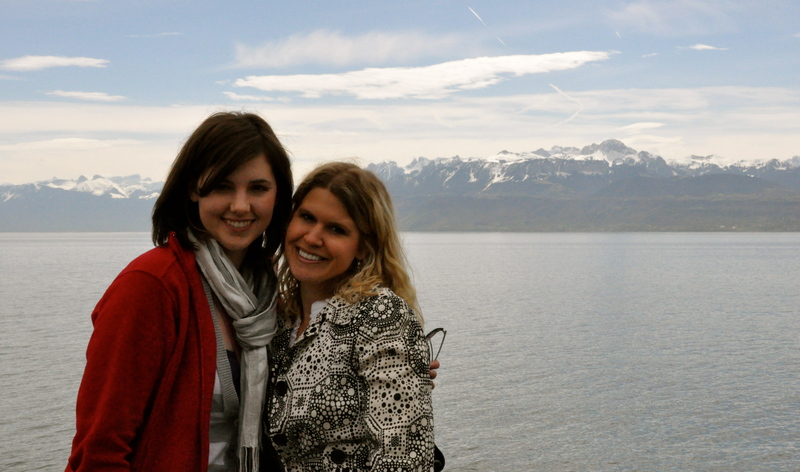 We wrapped up around 4pm and decided to skip the cheese factory in lieu of more time in the Lavaux wine region. Lavaux is an easy stop to add to any trip on the other side of the lake. We drove through the adorable wine village of Chexbres before parking at Vinorama, known to be open on Sundays and a place that hosts a variety of Lavaux types. Vinorama is a nice spot to take visitors, you may remember it from when The Captain and Swiss Miss were visiting. Gabe and Couch Surfer in Lavaux. The last time I came, the waterfall was frozen solid. Last time I came, we did a formal tasting. However, this time, we opted to each select two half glasses. Our selections rounded out the chocolate and the afternoon with a nice taste of another Swiss product.